Name Changer: A South Burlington Teen Speaks Out Against Racism | One to Watch | Kids VT - small people, big ideas! Since South Burlington High School was established in 1961, its sport teams have been known as the Rebels. Some believe the moniker is a nod to Vermont's long history of anti-establishment rabble-rousers — most notably Ethan Allen and the Green Mountain Boys. Others suggest the name is a subtle geographical dig at northern rival Burlington. Whatever the provenance, the name evokes an uncomfortable association for many: rebel soldiers of the Confederate south and a history of slavery and racism. That connection has never sat well with SBHS student and activist Isaiah Hines. He was born and raised in South Burlington and comes from a mixed-race background — his mother is half black and half white; his father is black and Puerto Rican. Isaiah is a track and cross-country athlete. Since high school nicknames are inextricable from athletics, he faced constant reminders of the Rebels name. "Every day at practice or at a game, it was, 'One, two, three ... go Rebels! '," he said. "It was a constant reminder that this is a reference to the Confederacy. And I couldn't stop thinking about that." So he did something about it. Last month, thanks in part to his efforts, the South Burlington School Board voted unanimously to change the nickname. The decision, despite inspiring a good deal of backlash, ended a heated 15-month debate. The push to remove the nickname began in August 2015 on the heels of a larger national discussion about Confederate iconography. Isaiah initially stayed out of the conversation. "I was genuinely too intimidated to voice my opinion, because there was such strong student support for keeping the name," he explained. "And I guess you could say there still is. But it didn't feel like an environment in which I could express that opinion." Mounting public pressure to change the name led to a school board vote that October. The board voted unanimously to preserve the Rebels name. In reaction to the board's decision, Isaiah founded the Student Diversity Union. The group, which currently has about 30 members, exists as an avenue for SBHS students to discuss issues of race, racial identity and racism. It organizes regular events, including lectures, community dinners and the occasional protest, all with the goal of promoting awareness of and dialogue around racial issues. In January 2016, Isaiah applied to join the school board as a student adviser. "It was the only way I could see to change [the nickname]," said Isaiah. "I figured it would be a lot easier to change it from the inside." 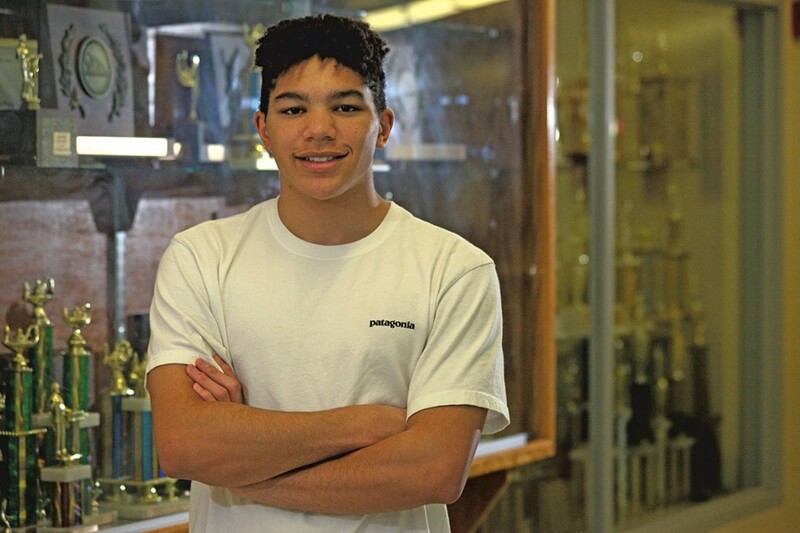 Isaiah credits longtime school board member Martin LaLonde as a key ally in his efforts. At a Student Diversity Union event last spring, LaLonde assured Isaiah that the debate was far from over. LaLonde voted — with deep reservation, he says — to keep the Rebels name in 2015. That vote came with conditions for the school to promote a culture of unity around the nickname, including the creation of a school diversity board. When Isaiah joined the school board, he challenged the effectiveness of those conditions. "Isaiah is very thoughtful," said LaLonde. "He's soft-spoken, though what he's saying packs a lot of punch." In addition to his organizing efforts in South Burlington, Isaiah is a member of Black Lives Matter Vermont, serving as a youth liaison to area schools. He also interns at the Peace & Justice Center in Burlington and works as a bookseller at Barnes & Noble. Isaiah, who will attend Columbia University in the fall, says the key to changing opinions about the Rebel name was raising awareness of the nickname's insensitive history, both in person and on social media. "Almost no one knows that history unless they have followed the debate or have done research on their own," he explained. For example, few current students knew that 20 years ago the school's mascot was a caricature of a Confederate soldier, or that Confederate flags used to be a common sight at Rebels games. When presented with that knowledge, Isaiah said, it's hard not to question a tradition that might otherwise seem harmless. "I know, from talking to students, that explaining that history does pretty easily sway people," he said.